VietNamNet Bridge – Forestry experts are optimistic about the future in Vietnam, largely thanks to community-based forest management. The model is developing extensively in the country, and experts have lauded its ability to increase forest recover, limit deforestation and create income from forests for local people. Quang Van Dong, chief of Hoc Village, a Thai ethnic minority village in Quy Chau District of Nghe An Province, said local people mainly earned money from bees, pepper, bamboo shoots and wood in the 500ha community-based managed forest. The Forestry Law of 2017 that recognised the practice of entrusting local communities, especially ethnic minority groups that rely on forest for income, was a key step in State forest management and protection. Community-based forest management was considered appropriate because it promotes sustainable management and use of forest resources and improves citizens’ livelihoods. Prof. Dang Hung Vo, former deputy minister of Natural Resources and Environment, said the model has grown across the world and in Vietnam, it was spreading and receiving support. According to the UN Environment World Conservation Monitoring Centre, the acreage of forest under the management of community in South America, Africa and Asia accounts for 11 per cent of total global forest acreage. Expert Vuong Xuan Tinh from Institute of Anthropology said spiritual issue was a factor motivating Vietnamese people to take part in forest management. “Thai ethnic minority people living in mountainous area understand the role of forest with their life and crops, as well as people’s responsibility to protect forests. The forest provides bamboo shoots, vegetables, mushrooms, herbal medicine and wood to build houses when they live or coffins when they die”. “Community-based management is the best form of forest management and popular among ethnic minority groups,” he said. The 2016-19 project ‘Water Resource Management’ supported by PanNature and GreenViet Biodiversity Conservation Centre selected Dak Rong Commune in K’Bang District, Gia Lai Province to implement community-based forest management. The commune’s 34,093ha natural forest, mainly production forest, faced many threats from deforestation to grow industrial crops, illegal encroachment of forest land and wildlife hunting. Five among seven villages in the commune signed forest protection contracts with the forest management board, worth VND200,000 per hectare pre year for each household. Forest patrol teams were set up in three villages. The project assisted local villagers in growing fruit trees and raising pigs. 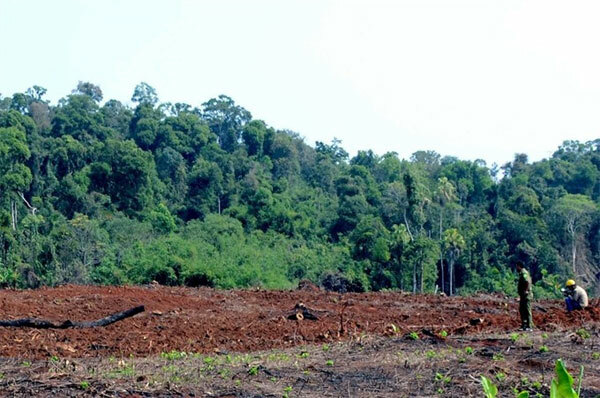 On the other side, some localities in the Central Highlands refused to allocate forests to local communities for management, instead giving the responsibility to State enterprises and forest management boards. Dr. Cao Thi Ly from Tay Nguyen University said in many places, ethnic minorities eventually still encroached on forests for farming due to economic hardships. In addition, land disputes still occur in many localities in the Central Highlands between local ethnic minorities and migrants, and local people with forest owners. “Coercive recovery of encroached forestry land, especially in ethnic minority areas, isn’t a good solution. In many areas, this solution is more and more contradictory,” Ly said. According to Dao Cong Khanh, from the Research Institute for Sustainable Forest Management and Forest Certification, the thinking of management agencies that to “allocate forest to people is deforestation” wasn’t accurate. By the end of 2018, Vietnam had 1.1 million hectares of community-based managed forest land, including natural and planted forest, accounting for 8 per cent of total forest acreage nationwide.